Depression can be a complicated issue for primary care practices. It's known to be common with certain conditions, such as myocardial infarction and stroke, and can affect outcomes if left untreated. But once a patient screens positive for depression, it's sometimes difficult to know what to do next. Recent guidelines recommend that primary care practices screen patients only if they have an adequate system in place to support a positive diagnosis. It's not always clear, however, what an adequate system might look like. Some practices have found success with integrative care models and online screening, but lack of resources for referral and treatment present additional challenges. In our cover story, Bonnie Darves examines ways to handle screening for depression in clinical practice. Remote monitoring programs have stepped into the spotlight as a way to keep tabs on elderly patients with conditions like hypertension and diabetes. 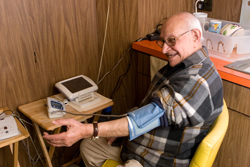 Patients who participate in remote monitoring use in-home scales, blood pressure cuffs, and other equipment to transmit vital data to clinicians' offices, alerting them to potential problems as soon as and sometimes even before they develop. But although remote monitoring has benefits that include greater patient satisfaction and fewer hospitalizations, it also faces some hurdles, including lack of reimbursement. Stacey Butterfield looks at programs using these technologies and addresses the pros and cons. Social media platforms like blogs, Facebook and Twitter are becoming almost ubiquitous in everyday life. What's not quite clear yet, though, is the place they have in medicine. Doctors experimenting with these new communication tools may find themselves beset with perplexing problems, like what to do when patients “friend” them, or how much detail to share on Twitter. Our story offers tips on using social media and how to avoid going too far. Have you ever accepted a Facebook friend request from a patient, or wished you hadn't? E-mail us about what you think of social media and medicine.